Click 'N' Connect from Stanley Tools offers customizable storage solutions. NEW BRITAIN, CT — Stanley introduces the Click ‘N’ Connect storage system – model STST19900 – ideal for homeowners. Commercialization Manager Naama Eylon said, “The number of different configurations offered to users by the Click ‘N’ Connect makes this a perfect solution for around the home or in the garage. Removable dividers and the ability to stack units allows users to create the storage configuration that they need, in a convenient and easy to store package.” The Click ‘N’ Connect 2-in1 model is comprised of two separate units – models STST19950 and STST14440 – a tool box and an organizer unit, respectively. 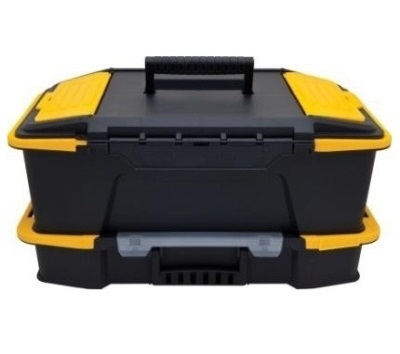 The Click ‘N’ Connect tool box – model STST19950 - features a unique lid that can be opened from either side for convenience or removed completely. The unique shape and proportions allow storage for both power tools and hand tools combined. Removable dividers allow users to create their own configuration to address their storage needs, from 1 large compartment or up to 9 sections, making it ideal to hold loose nails, bolts and more. Two lid organizers also create additional storage options. The Click ‘N’ Connect organizer – model STST14440 - also features removable dividers for customizable storage. A clear durable plastic lid provides visibility and helps prevent the contents such as small hand tools, nails, and screws shifting and mixing. Easy to use latches enable smooth, hassle-free connecting and detaching from the tool box. In addition, two organizers can be clicked and carried together. Stanley, a brand of Stanley Black & Decker, Inc. is a diversified worldwide supplier of tools and engineered solutions for professional, industrial, woodworking, construction and do-it-yourself use. For over 170 years, the trusted Stanley brand has been synonymous with quality, value and reliability. Its well-known hand tool and storage brands include Stanley, FatMax and FatMax Xtreme. Headquartered in New Britain, CT, Stanley Black & Decker, Inc. operates multiple manufacturing facilities and sales offices throughout the globe. For more information, visit Stanleytools.com or follow Stanley on Facebook and Twitter.